Still on my 100 Day Project Journey. 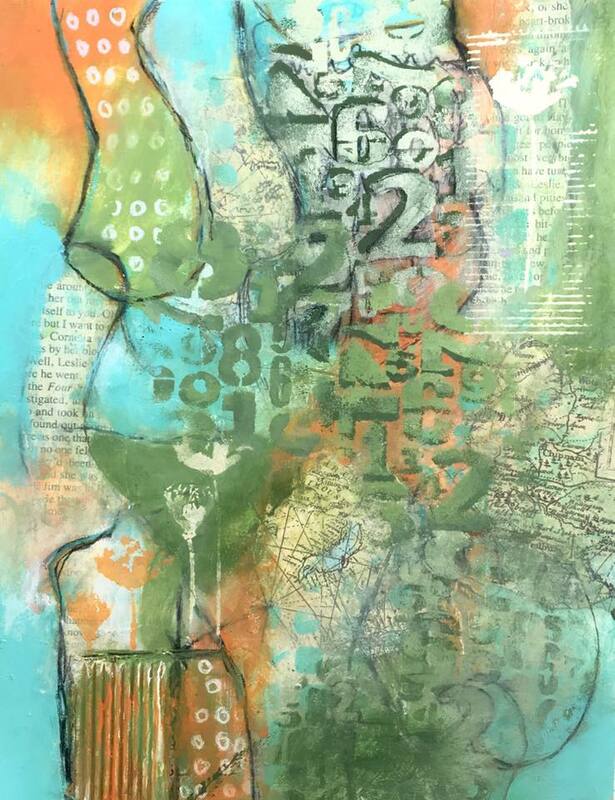 I am attempting to make 100 abstracts. Not sure how long this project is going take me. I have now completed days 46-50. The new year is upon us. As you are finishing your holiday shopping and getting ready for the celebrations, don't forget to send you new year wishes. This card is quick and easy to make. 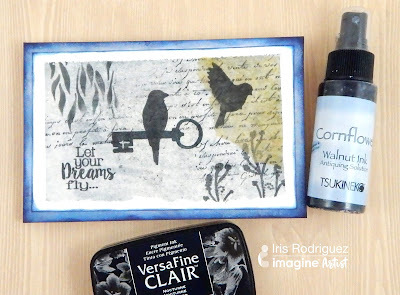 This card is made using Imagine's Craft Sprays. 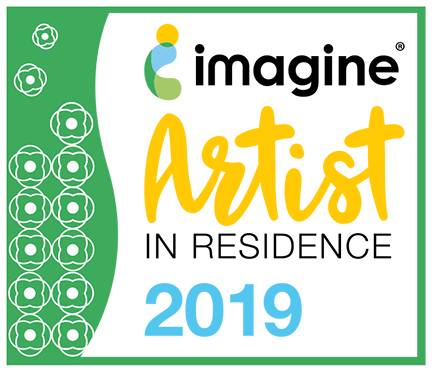 Check out my quick tutorial on Imagine's blog. 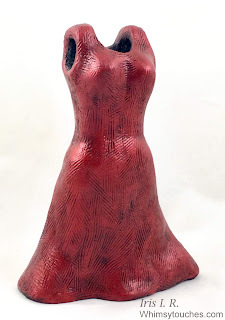 My little red dress sculpture made using stoneware clay. She measures around 7 inches and is 4 inches at the widest point. Christmas is around the corner. As we go about shopping for others, take a little break and make something whimsical and holiday themed for yourself to go with the nice threads that you will be wearing during the celebrations. How about a polymer clay Christmas Tree pendant. 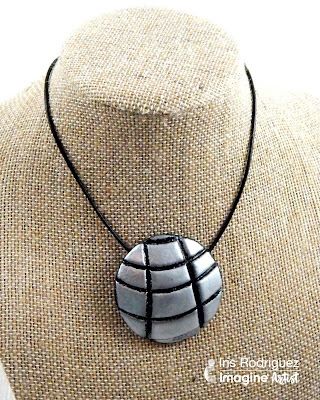 I made this pendant using black polymer clay and Makin's Clay tools; Geo Mini Cutters, and rolling cutters. Check out my quick tutorial below. Roll out two sheets of clay on the pasta machine to the fourth thickest setting or use a roller. Cut out desired tree shape and size template by using a piece of cardboard. Place the template over the clay, using the template as a guide cut out the tree. Cut out the stars using the star shape from the Mini Geo cutter set. Make the wavy lines on the trees by rolling the crinkly cutter across the tree. Don't press too hard or you'll end up cutting it. Place tree over the second sheet of clay and cut. If using a bake clay, bake the clay according the manufacturers directions on the package or let if using air dry clay, allow the clay to air dry. Before we put products, paint the tree with black gesso. This allows the products to better adhere. Rub on the Patina Gilders Paste on the tree and use the silver paste for the stars. Add a thin layer of Judikins Diamond glaze on the stars, then sprinkle the glass glitter. Add another layer of Judikins Diamond, filling the stars' cavity. Also add glaze to the star tree top. 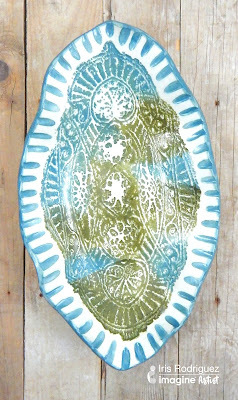 Let it dry, allow to glaze to dry for more than an hour. When wet it looks hazy and shows clear when dry. 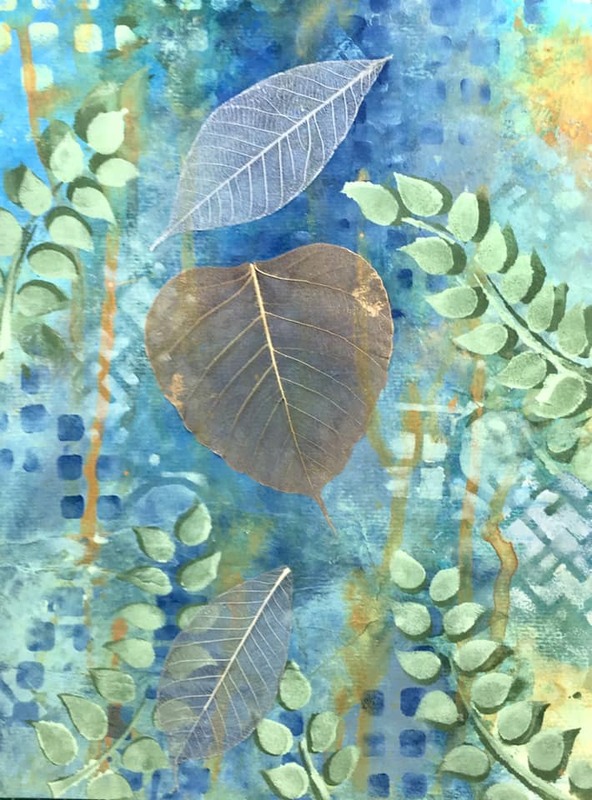 You can also color the tree with acrylic paints, mica powders, which you can use when the clay is baked or unbaked. Hope you enjoyed my project. Happy holidays! 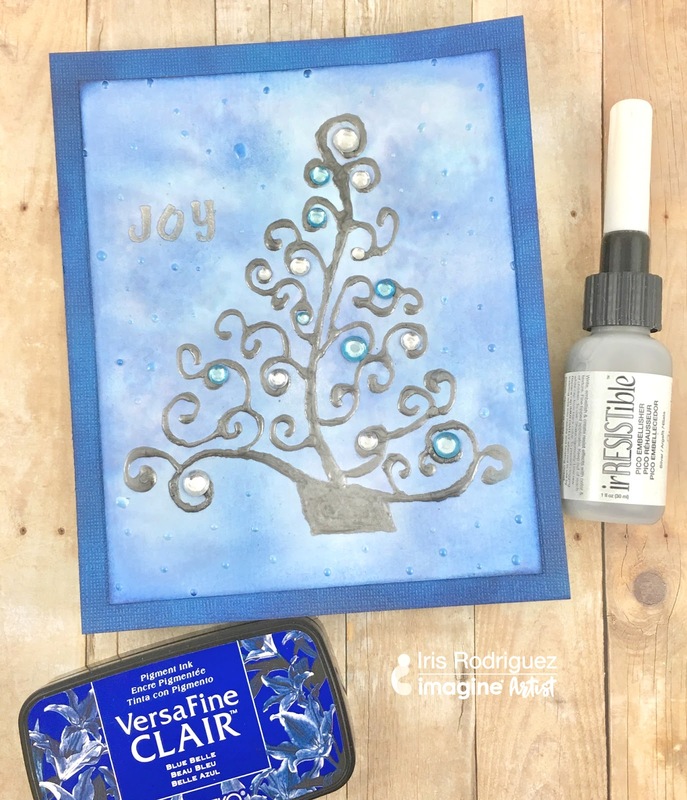 Today I am on the Imagine blog with this minimalist easy to make card by creating Christmas doodles with Imagine's IrRESISTible Pico Embellisher, check out the tutorial on the Imagine Blog. 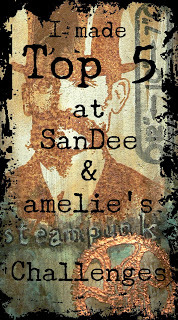 The Steampunk genre was made up in the 80s; it was inspired by fiction writers Jules Verne, H.G. Wells and many others. Verne wrote 20,000 Leagues Under the Sea. The book was made into a movie in the 1950s. If you get a chance watch the original movie; there is such cool Steampunk eye candy. Flying machines, submarines, cool guns, corsets and Victorian dresses define the genre. The inventors of the genre decreed that Steampunk devices/machinery had to be made out materials that existed in the Victorian era; which, can be retrofit them with steampower tech. Also, it's supposed to be a utopian world, so your cool Steampunk creations can only be used for good. With this in mind, I know that bottles existed in the Victorian era. So my winged bottle is created to fly around sending positive messages. If only, lol! In reality, I made my bottle using Makin’s® Clay Gears Texture sheet and black Makin’s Clay®. Ahem, I am still working on retrofitting it with steampower tech though, lol! Do you remember learning your ABC's as a kid? Aahh, those nice innocent days. Not that I'm still learning my alphabets, lol! 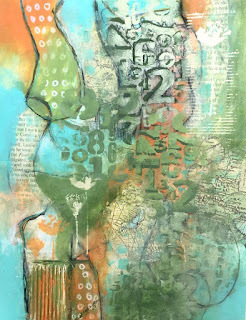 But I do like using alphabetical themes in my art; check out my Lost of Words altered bottle. 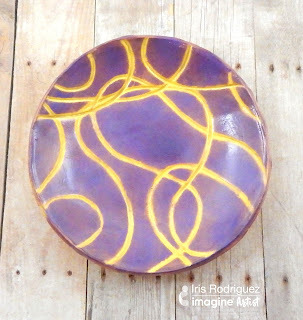 Also, my whimsical alphabet polymer clay bowl, using Makin's Clay cutters and clay. Speaking of Makin's Clay, I made my alphabet pendant using metal letters and Makin's Clay in black. 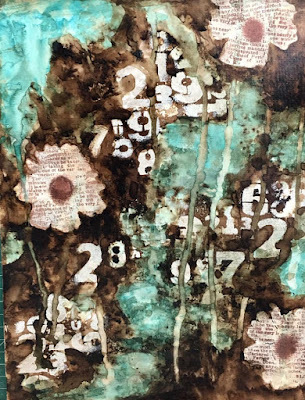 I simply laid down a thin sheet of clay onto the bottom of the bezel, glued on the letters and then on a second sheet, cut a slit where where the letters would peek through, then glued the second sheet over the letters. I added a little bit of texture. I hope you like my little pendant. Do you ever think about things too much and wish to get out of your head? 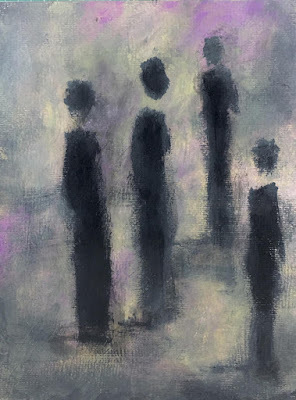 Why not turn turn to creative endeavors, to “free your mind” and create what the muse wants instead. 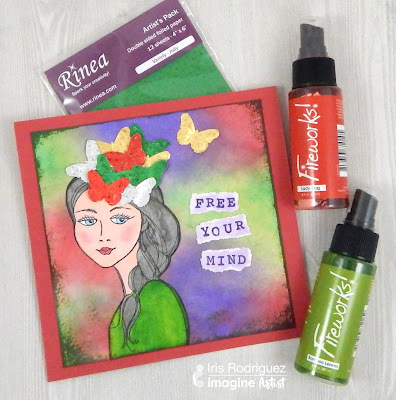 At Imagine were have the fun challenge of creating projects with Rinea foils. There are so many funs things you can do with these foils; you can stamp on it, paint, use with mediums or create 3D decorative projects. 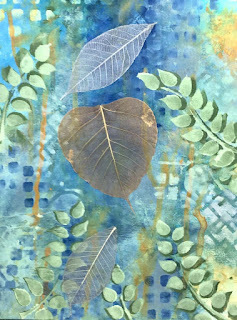 For my card I have used foils as an embellishment, check it out. Still on my 100 Day Project Journey. 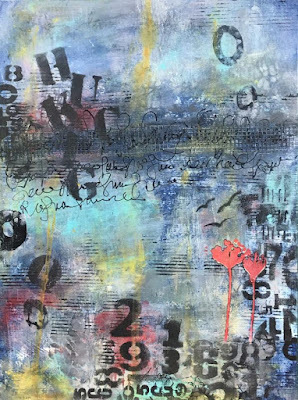 I am attempting to make 100 abstracts. Not sure how long this project is going take me. I have now completed days 41-45. Count on me, to bring you, yet another project to share. 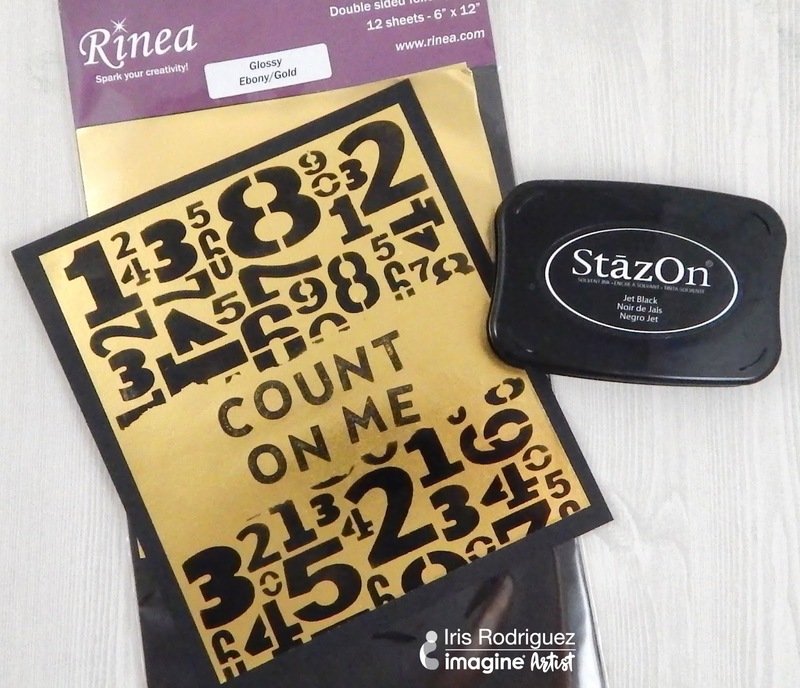 This month at Imagine we are playing with Rinea Foil Papers. You can stamp, cut, paint, sand and create 3D project with these foils. 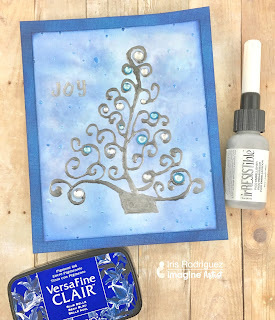 I decided to stamp and stencil on them using Imagine's StazOn ink and GlazeOn glaze medium. Check out my project on Imagine's blog. Remember when you were a little girl and used to dress your dolls or make paper dresses. The neat thing about making paper dresses is you got to design your own dresses. Well child's play does have to stay, well...child's play. 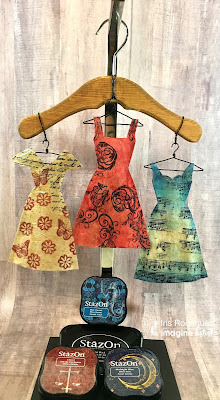 I made paper dresses using the leftover teabags from my tea and stamped design using Imagine's StazOn inks and Creative Medium. 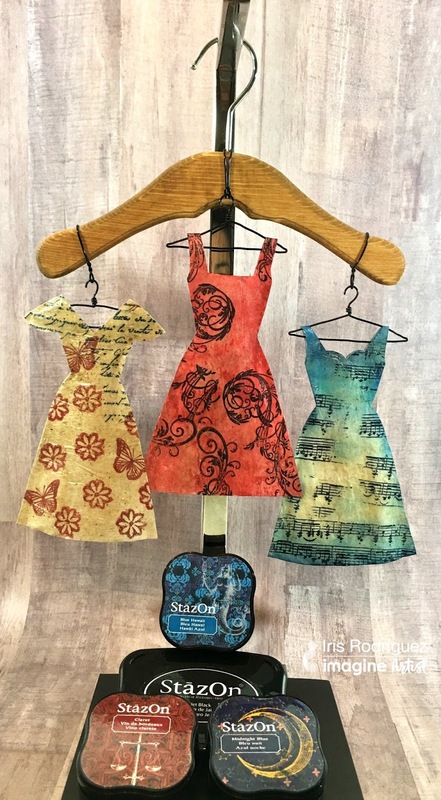 These little dresses can be used on greeting cards, art projects or place in shadowbox and make a nice home decor that any girl, young lady or yourself is sure to enjoy. To learn how to make these dresses, visit the Imagine blog. Today I am happy to be participating in a blog hop, where we will feature Imagine's inks and Crackerbox and Suzy stamps. This hop will run Thur Oct 18th and Fri Oct 19th 2018. 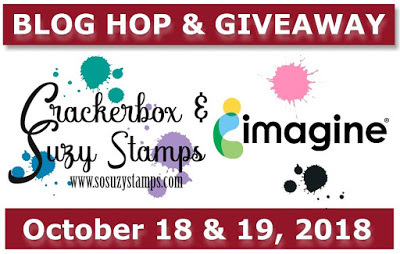 Imagine and Crackerbox & Suzy Stamps, each are offering a $25 Gift Certificate. Each company will pick ONE person. 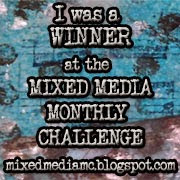 All you have to do is leave a comment on each designer's blog AND corporate blogs on any of the two days. Double your chances by leaving comments on each designer's blog and corporate blogs on both of the days. I will feature a project for Oct 18th-Day 1 and will provide links to the projects running on this day. I made this project as an homage to routines; whether it's going to an office or being at home taking care of the little ones. It's important to remember to do things with love and positive intentions. Kinda of helps from going stir crazy too. Speaking of stirring things, coffee helps out the with that as well, lol! At least, is how I like to think of things. I used the Crackerbox and Suzy Coffee Cup Heart stamp. 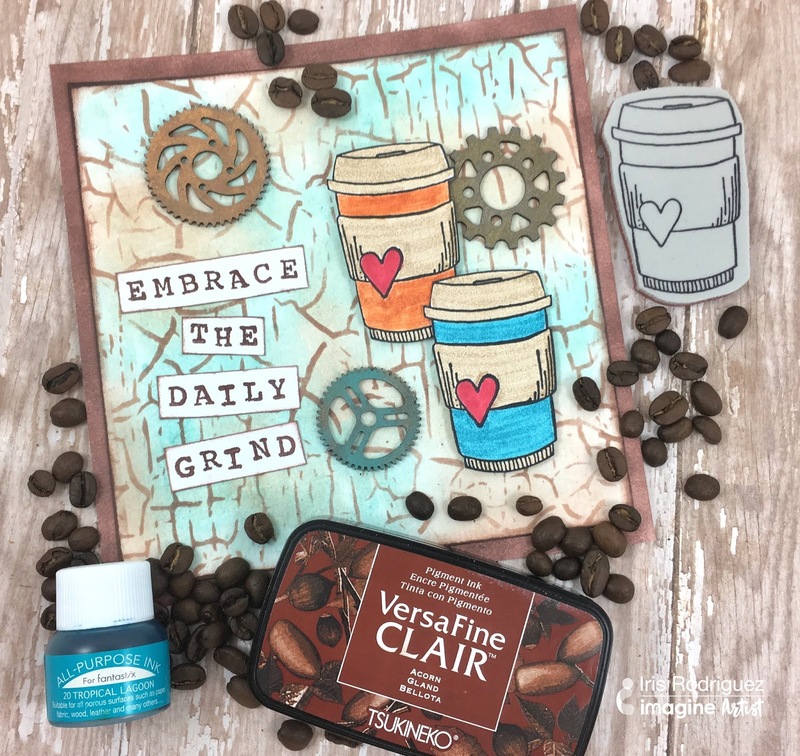 I colored the background with Gingerbread, Turquoise Gem VersaMagic and Acorn VersaFine CLAIR inks. Also used the Acorn colored ink to color the main card. 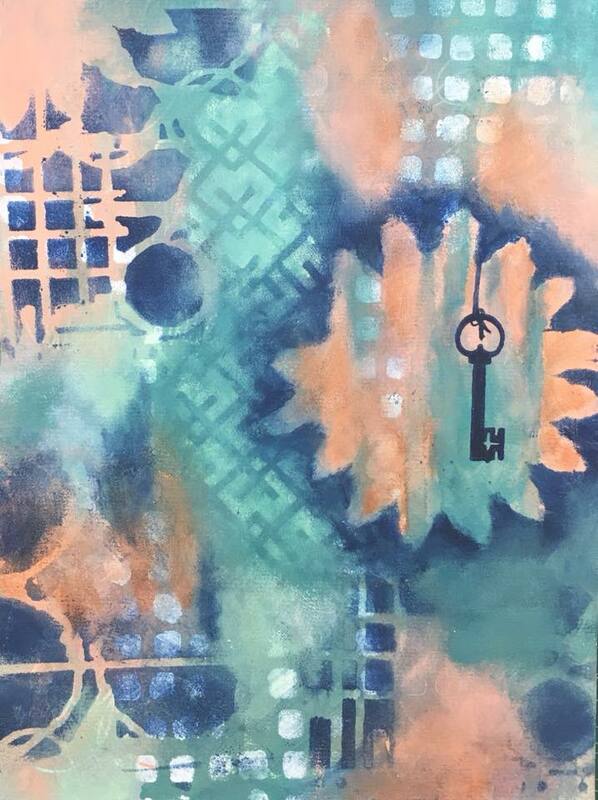 The background's crackle design is a stencil from Deco Art, also used the Acorn ink. 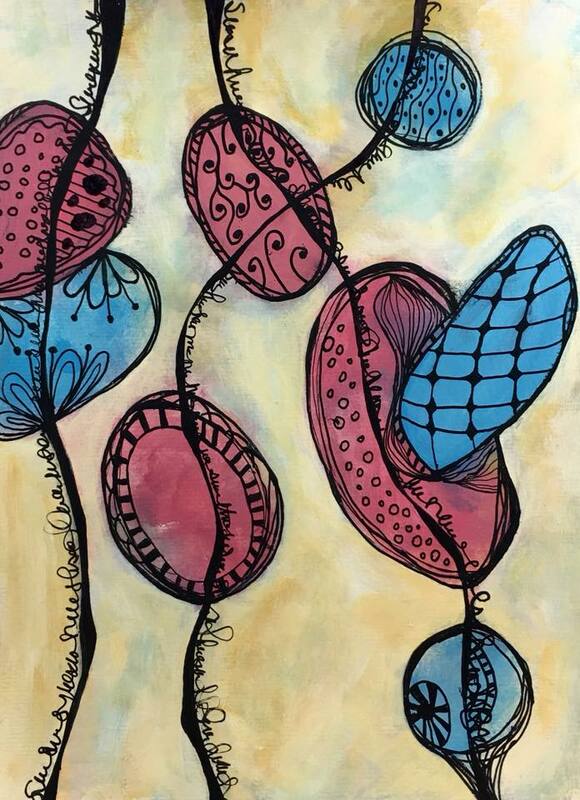 I colored the coffee cups with Tropical Lagoon and Sand All Purpose Inks and Tangerine Fabrico Marker using the brush Fantastix. 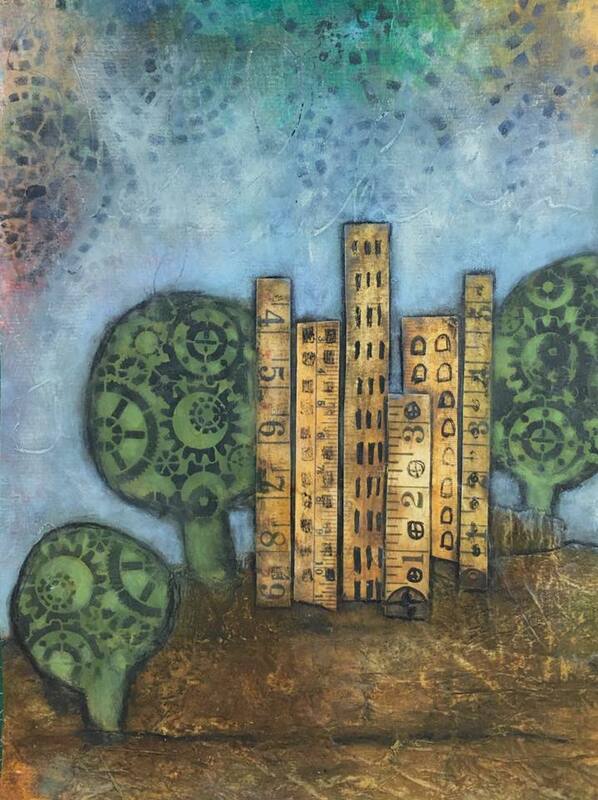 I colored the chipboard gears with Turquoise Gem VersaMagic; Galaxy Gold and Celestial Copper Brilliance inks. I hope you like my project. 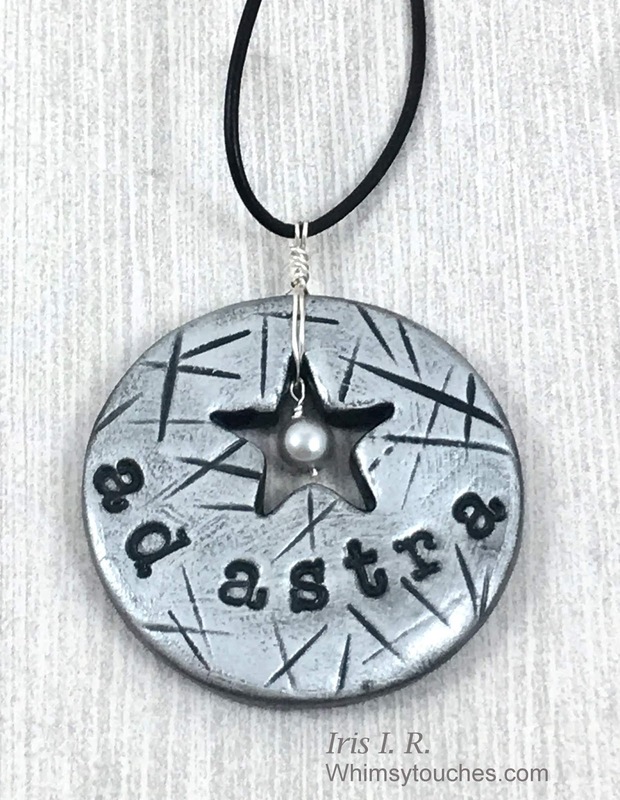 So, one of my favorite phrases/quotes is "Par Ardua, Ad Astra" latin phrase for "Through Adversity, to the stars". It's also the motto of the Canadian Royal Air Force. I like it; I find it inspirational. I could not fit the whole quote on this size pendant, the letters were too big. That's okay, I used half the phrase and I like how it turned out. I will make a future project with the whole phrase though, perhaps a tile. 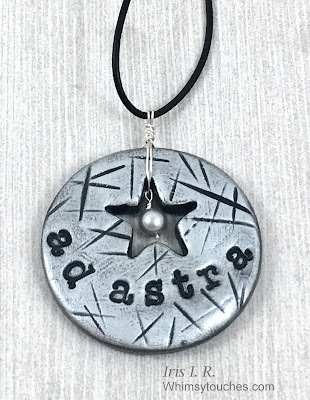 I made this pendant using Makin's Clay star and round cutters and the surface is colored with Silver Gilder's Paste. I have also wire wrapped a little silver pearl. I hope you like my pendant. It's fall, yeah! My favorite time of the year. Just love the warm fall leaf colors, Chai lattes, pumpkin patch trips, foliage drives, and light sweaters. So in honor of this great season, I made a wall hanging using Makin's Clay leaves mold and white clay. 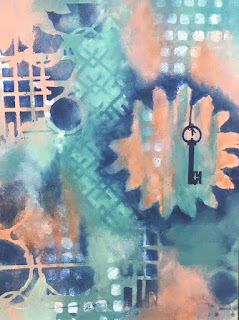 For the surface treatment I have used Imagine inks. Check out the tutorial on the Makin's Clay blog. I have quick share today. 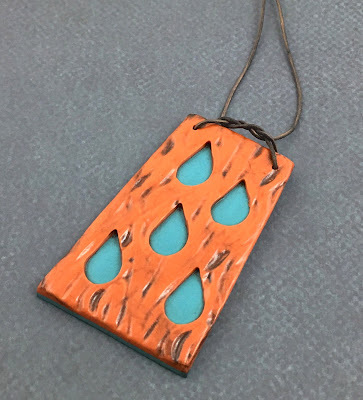 My Raindrop pendant inspired by the very rainy, hurricane season we've been having. 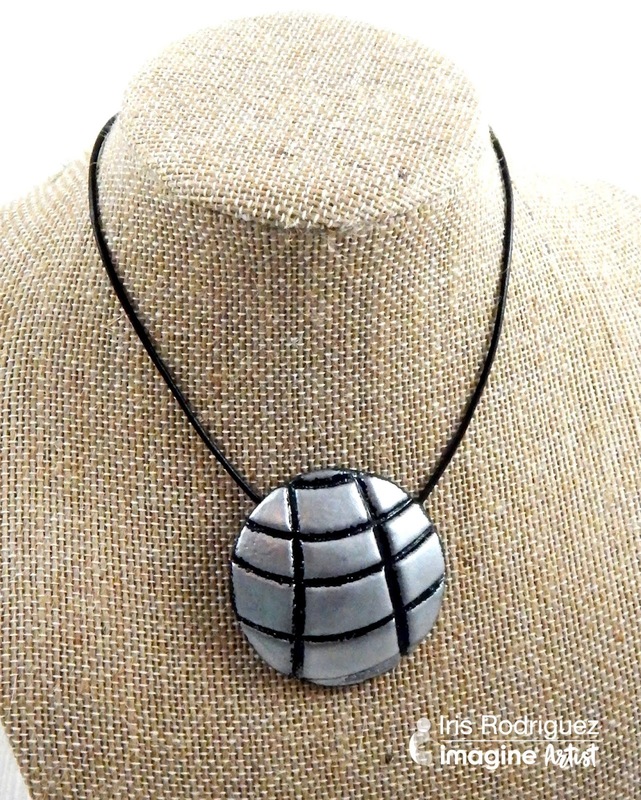 This pendant is made using Sculpey's Soufflé polymer clay; Pumpkin, Sea Glass and Igloo. I also used Makin's Clay Texture sheet, Set H and mini raindrop from the Mini Geo cutter set. I have quick share today. I've made this polymer clay pendant; surface treated it with silver embossing powder from Imagine. 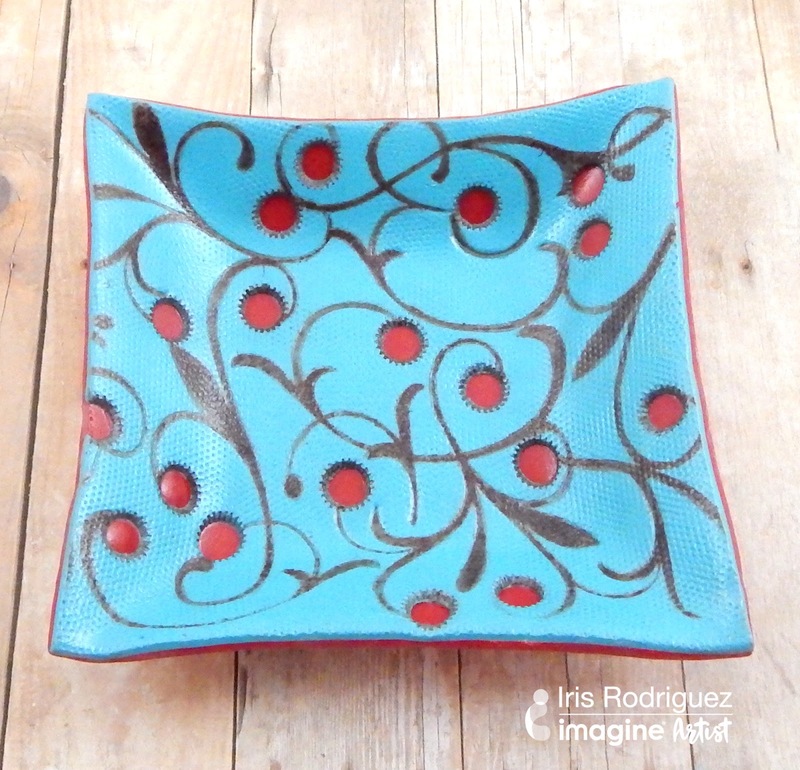 Learn to make this by visiting the Imagine blog. 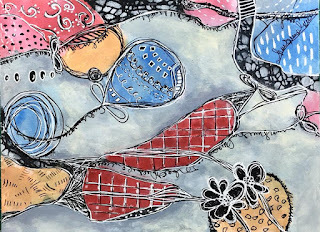 Did you know you can use inks you use in paper crafting on polymer clay. 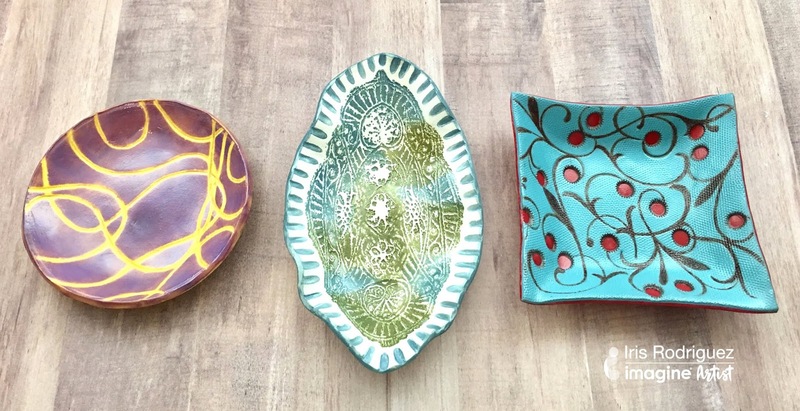 You can color and stamp with inks into your clay projects. Specifically, I find pigment and solvent inks work best on polymer clay. Stamp ink while the clay is raw or after it has been baked (cured). It is very important to heat set the ink so that it does not smear. You can heat set when baking the clay. 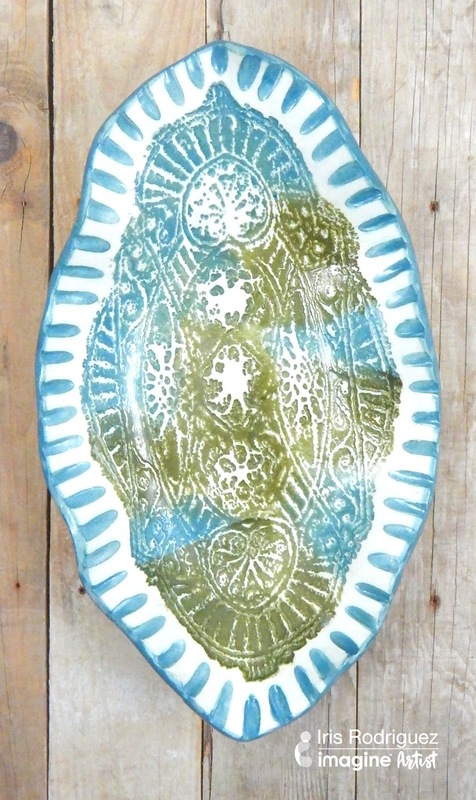 If you add ink on cured clay, throw your clay project back in the oven heat set for about 10 mins. You can also heat set with a heating tool. 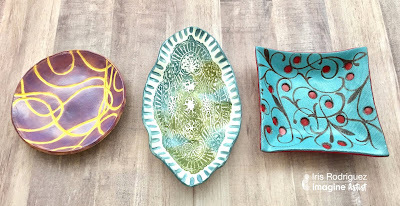 For this project, I create three different bowls using Sculpey Souffle clay with Imagine's VesaMagic Dew Drop and StazOn inks and demonstrate several techniques when using inks. 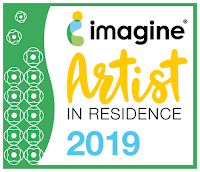 Visit Imagine's blog site for detailed instructions. Hope I pique your interest and give these projects a try. I am so ecstatic to be part of the Rhode Island Art League "Parsing Sign and Image" Art Exhibit. The show runs Sep 14, 2018 through Dec 1, 2018; with a reception Sep 27 5:30-8 pm . This goal of this exhibit is to consider the influence of letters, text, signs and language. 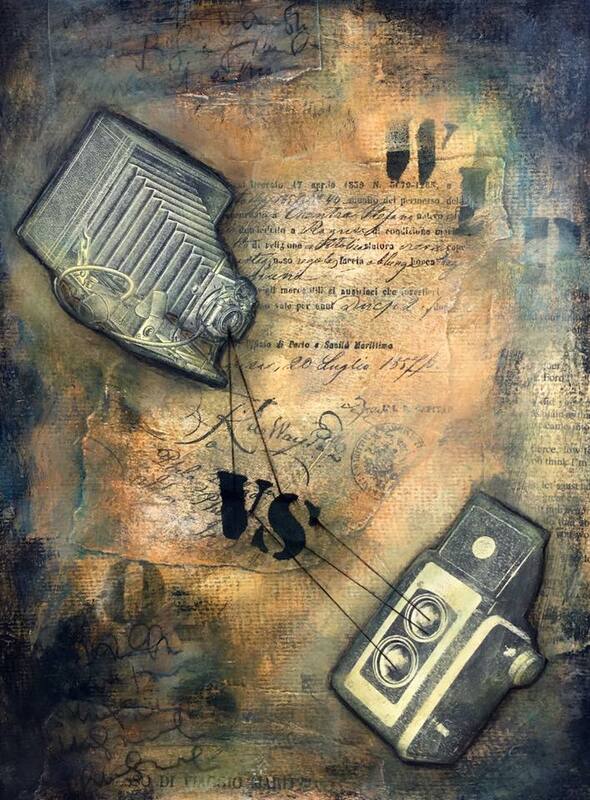 My piece is an assemblage piece I call "Beneath the Truth". Inspired by our current state of affairs. We get so much information from in different forms; television, government, social media, newsprint, court transcripts, websites. We tend to believe what we read and take it at face value, but should we? The summer is almost over in most of the United States. Thank goodness, it's been freakishly hot. But all hot things aren't so bad. Like depicting hot themes in art. First, it does not burn, second it's a fun way to express yourself as I did with my fire theme dress sculpture I call "Fire Within". This dress measure around 11 inches in length and 7 inches at the widest point.